Although revisits to restaurants have never been a high priority, there is one that I've been itching to do. 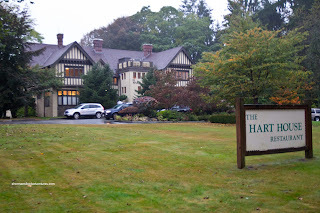 Early on in the life of this blog, I went to Hart House during Dine Out. It was a so-so experience which probably wasn't completely representative of their regular menu. I really thought that it was not a fair assessment. However, with so many great places to eat in Vancouver, the return visit got lost in the shuffle. Then suddenly, a Hart House Groupon appeared, which I quickly snapped up. It was almost as surprising to see this as the one with The Pear Tree. I ended up making a reservation for a Friday, which I would later find out was the same night as the Hot Chefs Cool Jazz event at EBO! Okay, this meal better deliver because I was missing out! 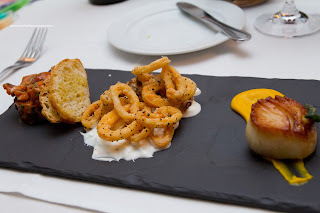 Starting the meal off, I had the Seafood Trio consisting of Ponzu Salmon Tartare, Crispy Calamari and Seared Scallop with squash puree & crispy sage. I found the tartare to be buttery with just enough ponzu to flavour, but not to overwhelm. The crostinis were a nice eating vessel since they were a crunchy contrast to the soft salmon. The crispy, tender, yet slightly chewy calamari lived up to its namesake with a peppery kick. The thick tzatziki underneath was a nice match. However, the star of the slate plate was the beautifully seared scallop. Crisp and browned on the outside while buttery soft and barely cooked on the inside, I wished there was more than just one. The squash puree appeared to have some seafood essence (which we're guessing was lobster) which added a subtle sweetness to the scallop. 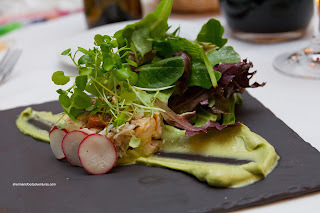 My mom had the Dungeness Crab Salad with avocado cream, radish and sun-dried tomato oregano vinaigrette. Hidden beneath the micro greens was a puck of fluffy crab. And it was all crab, no filler. They were in big pieces being naturally sweet and fresh. The avocado cream was smooth and did nothing to take away from the delicate crab. 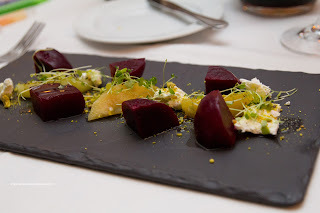 Viv had the UBC Beet Salad from their 2-Course Harvest Menu (for $32.00). It consisted of pickled beets, honey beets, poached apples, chevre, pistachios and baby watercress. She loved the beets as they still had some texture despite being soft. She is not a huge fan of goat cheese, so I was given the task of eating it all (but I liked it!). My dad had the Autumn UBC Squash Veloute (from the Harvest Menu as well). 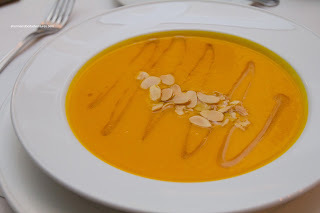 With the addition of toasted almonds and maple cinnamon beurre noisette, the soup benefited from some additional sweetness and different flavours. For my main, I went for the Duck Leg Confit with goat cheese hash, savoury cabbage and grainy dijon Spaetzle with a warm bacon vinaigrette on top. I thought this was a pretty well-executed dish. The skin was nicely rendered and super crispy while the duck meat was dry in spots. I liked how the meat was not salty where it allowed the other ingredients to be noticed, especially the bacon vinaigrette. It was the salty acidic hit that provided balance to the sweet cabbage and plethora of creamy goat cheese. I loved the spaetzle as it had a bite while still being fluffy. 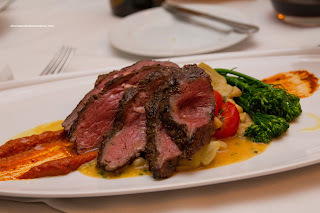 Predictably, my mom went for the only lamb offering on the menu being the Grilled Lamb Sirloin with house made Harissa, broccolini, Cannellini beans, haricot vert, artichokes and tomatoes. More often than not, a lamb sirloin can be somewhat chewy if it is of poor quality or not prepared properly. That was not the case here. The meat was super moist and tender. It was grilled a perfect (yes, it was perfect) medium-rare. We didn't find it particularly gamy, however, the harissa helped in that regard with a mild spiciness. 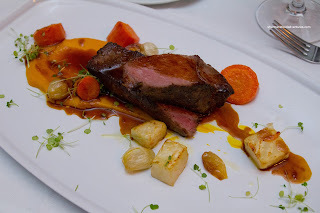 Viv had the 48-Hour Sous Vide Beef Short Ribs with squash puree, roasted root vegetables, small onions and braising jus. The pieces of short rib were melt-in-our mouths soft while at the same time being meaty. There was depth-of-flavour from the sauce which was balanced by the sweet puree. My dad had the Pan-Seared Arctic Char with braised red cabbage, cauliflower puree, fingerling potatoes and crispy brussel sprouts. A crispy sear on the skin side gave way to a moist and flaky flesh which was only mildly seasoned so it didn't overwhelm the fish. The fried brussels sprouts were really good and we forgot they were brussel sprouts. For the kiddies, we ordered them the Pork Shoulder Pappardelle (with arugula, pine nuts, shaved Grana Padano and braising jus) to share. What you see in the picture is a half-portion, since they split the dish into 2 plates. The shredded pork shoulder was rich and delicious while the sauce was silky and slightly sweet. 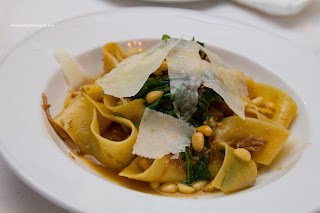 Although the pasta was al dente, the whole dish had very little flavour. 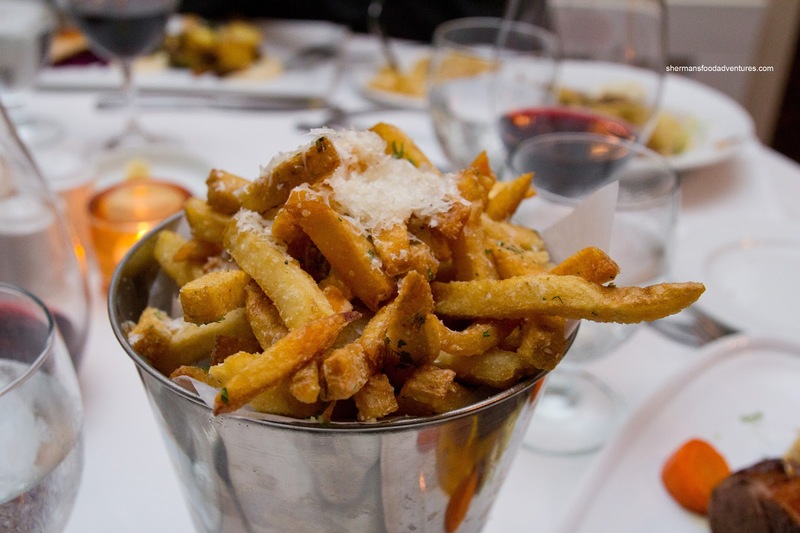 We did get some bitterness from the wilted arugula and savouriness from the cheese, yet in the end, it needed salt. Lastly, we got a side of the Truffle Parmesan Fries, which arrived in a very large portion. These fresh-cut, double-fried spuds were really good. They were crisp and full of essence and flavour. We couldn't stop eating them. Finally, we made it to dessert where my mom went for her standby - Vanilla Bean Creme Brulee with a cocoa meringue. 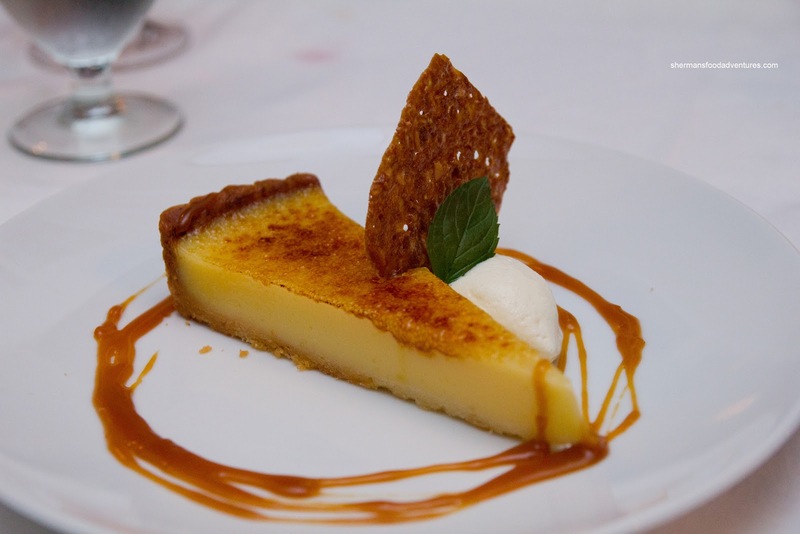 I liked how it wasn't overly sweet with a rich smooth custard. 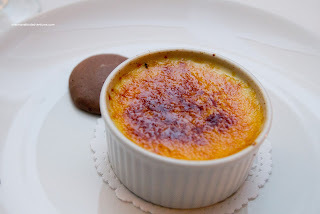 The burnt sugar topping was just the right thickness. Overall, a solid effort. Viv had the Caramlized Lemon Tart (which I had my eye on as well) with nut tuille, orange caramel and Mascarpone cream. I found the lemon curd to be rather stiff in texture. It was quite tart though which was counteracted by plenty of sugar. The crust was moist and could've benefited from a softer curd. For myself, with the lemon tart already claimed, I had the Autumn Fruit Trio consisting of Pumpkin Cheesecake, Chocolate Cardamom Panna Cotta and Banana Beignets. The pumpkin cheesecake was slightly stiff, yet still creamy and smooth. There was a noticeable nutmeg hit and I liked the fact it was not too "pumpkiny" since I'm not a huge fan of pumpkin. It was not too sweet either, which suited me just fine. The panna cotta was also a bit dense. It had a noticeable cardamom hit which made it a touch herbal tasting in combination with the bitterness from the chocolate. 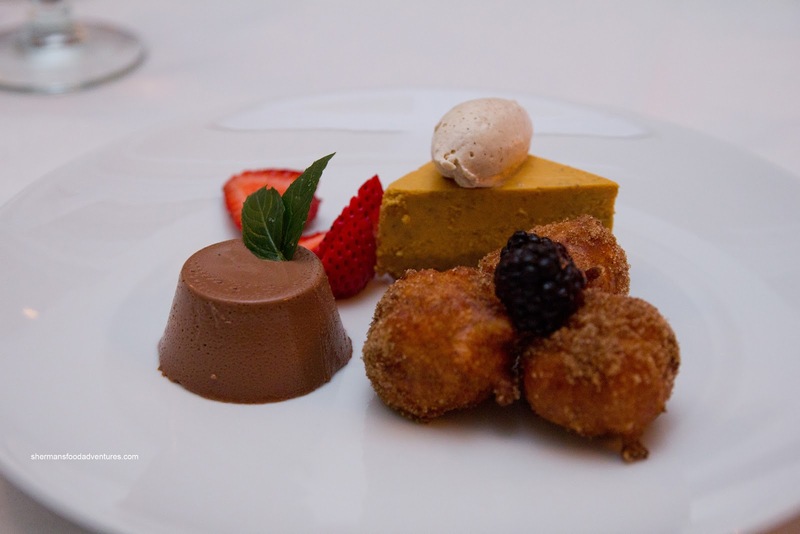 The best part of the trio was the banana beignets. They were warm and soft with just a touch of banana. 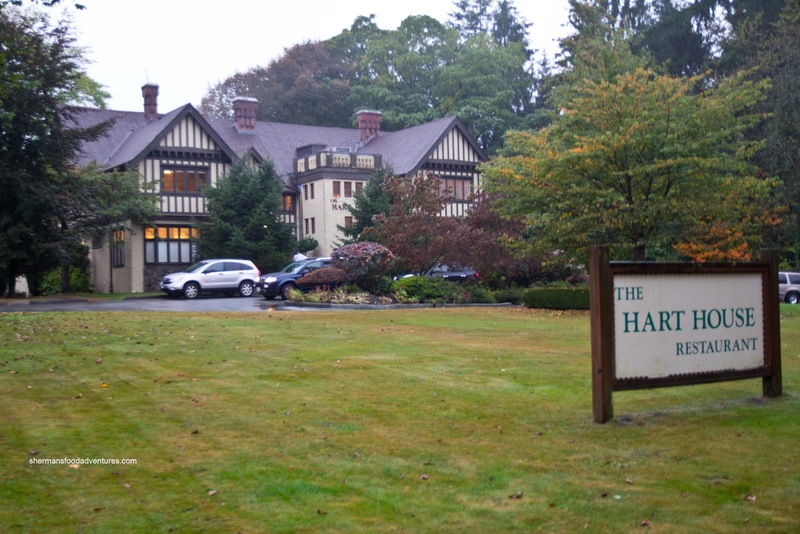 Okay, I'm gonna admit it - we were pretty surprised with our meal at Hart House. 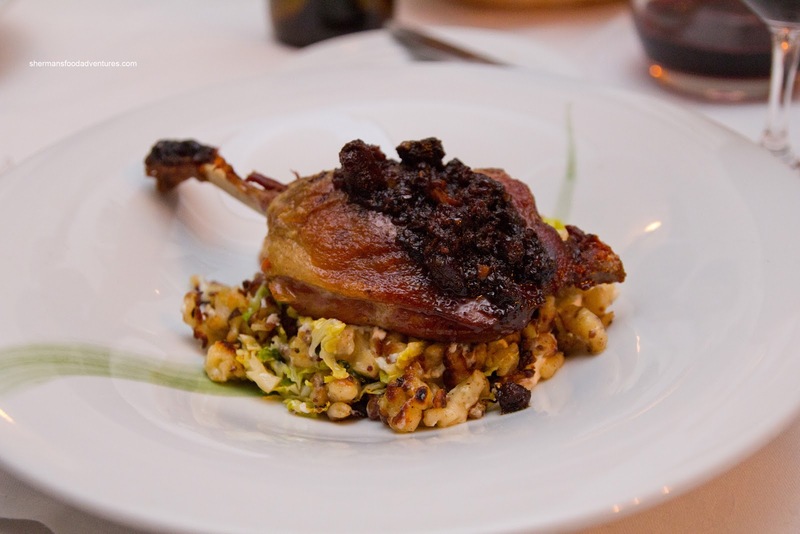 We weren't expecting the consistent level of execution with the majority of our dishes. 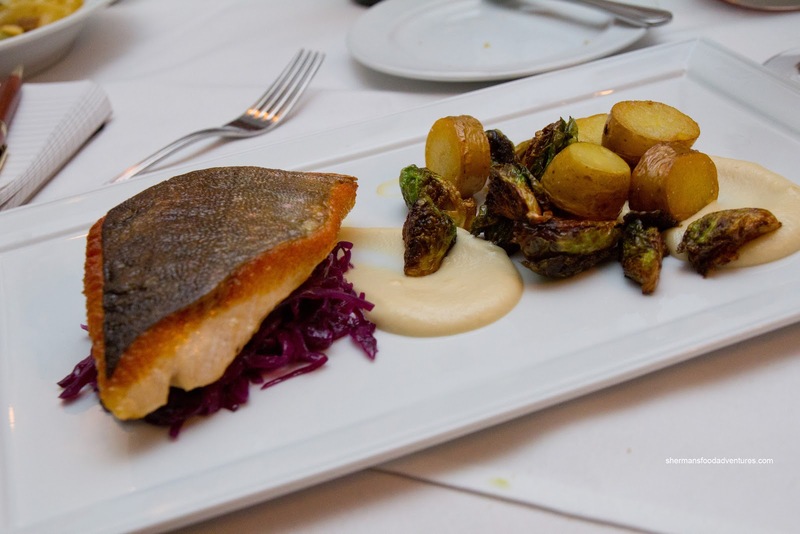 It appears that the new Executive Chef, Alana Peckham, had put her stamp on the new menu. The proteins were nicely prepared as well as the sides. Furthermore, the service was attentive and courteous. I'm glad I spotted the Groupon and am also glad we made a return visit.